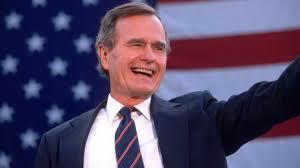 I was surprised, but not shocked, as I woke this morning and learned of the passing of our 41st President, George H.W. Bush. In reflecting upon his life and times I realized it was truly a different era. We saw an era of grace and respect. A call for volunteerism and service before self. It was the end of the Cold War and the promise, now unrealized, of world peace and prosperity. We had ideals and goals. We knew that America was the greatest country on the planet and we believed in our direction and ideals. We were a thousand points of light for the world! "I will never apologize for the United States — I don't care what the facts are. ... I'm not an apologize-for-America kind of guy." —comments during an Aug. 2, 1988, campaign stop about the USS Vincennes' mistakenly downing a commercial Iran Air flight, killing 290 civilians. This is America ... a brilliant diversity spread like stars, like a thousand points of light in a broad and peaceful sky." — acceptance speech at Republican National Convention, Aug. 18, 1988. "America is never wholly herself unless she is engaged in high moral principle. We as a people have such a purpose today. It is to make kinder the face of the nation and gentler the face of the world." —inauguration speech, Jan. 20, 1989. "My dog Millie knows more about foreign affairs than these two bozos." —during his unsuccessful 1992 re-election campaignagainst Bill Clinton and Al Gore.